Oliver and Lola have been best of friends for eight months, ever since they were briefly married in a wild night in Vegas. However, unlike their friends, Oliver and Lola never consummated their relationship, and have remained strictly in the friend zone. Lola is consumed by her work: becoming a NYT best seller / graphic novelist sensation overnight, her book is now in the process of being made into a movie. Oliver’s newly opened comic book shop is wildly popular, and he works every day. Their friends all see how perfect they are for each other, but Lola and Oliver are both scared of messing up the friendship to push for more. Dark Wild Night is the third book in the Wild Seasons series by Christina Lauren. Although the book is a standalone romance, we meet Oliver and Lola in the first book, and I think seeing them in the previous books helps define their backgrounds and makes for a stronger history. As the book opens, we witness how much their mutual bond means to both, and how much each loves the other. The unrequited love is so overwhelming, that I am swept up in their secret desires as much as the characters are. The authors are masters at building up the emotional and sexual tension, and I literally felt like I was going to explode before these two finally fell into that first kiss. Oliver is an amazing man: he’s patient and gentle. He wants what is best for Lola, even if it means sacrificing his own feelings. So that moment, when he first senses the change in Lola, is so exciting, I imagine him like a dog with its tail wagging, watching his owner come home. The love inside of him wants to burst out, and he can barely contain it. And it is so overwhelming that Lola nearly drowns in her feelings. She’s terrified of being like her mom, who abandoned her and her dad, and she’s scared of losing Oliver forever. Her fear is tangible, but it is equal to the power of her love. In the end, I loved Lola and Oliver’s story, but I wanted more. There was so much overwhelming emotion at the beginning of the book, but then it got lost in Lola’s desperate crazed life. And I get where Oliver was coming from, but I was disappointed that after he promised he’d take it slow and stand by her that he did a 180 when she hurt him. I wanted more by the end – more of them together, on solid ground. 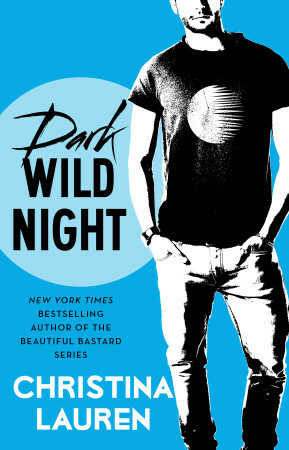 Of all the titles, Dark Wild Night was most like an HFN than the others. Lola and Oliver didn’t feel as settled; that they just barely got their act together by the end of the story. And maybe it’s because I’ve fallen so hard for these characters, I want – need – more and more! The Wild Seasons series has quickly become one of my favorites, and will be one of my go to comfort reads. The romances are genuine and passionate. I highly recommend the books to all! Yes! I started with #4 (Luke and London) and after I read it, I had to go back… it was so worth it. Love this series!! I hear you! I was totally not in favor of the “NA concept” and still have my concerns, but this series is FABULOUS! It’s wonderful contemporary romance, whose main characters just happened to be in their early 20s. I highly recommend. I hate the NA label. It doesn’t really mean anything but the age of the characters. Think in or just out of college.